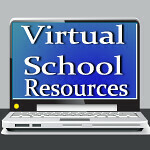 Virtual School Resources: Have you seen Study Dog? More and more companies are coming out with phonics programs, which, in my humble opinion, is not a bad thing. According to an article in the Huffington Post, high schoolers are reading books appropriate for fifth graders. If my child was in that group that needed help, I would do whatever it took to improve their ability to read. This isn't a subject a parent should take lightly. It's not like that marine biology class that may never be discussed again. This inability will follow them all their lives. Though there are programs that help the struggling older reader, the time to really focus on reading is when they are young. Finding a program that engages the short attention span of most little ones is so important. When your child asks to do another lesson, you know you are on to something. Study Dog looks like it would hold the attention of any young child. Its engaging, colorful format looks more like a fun game than a learning tool. You'll also find tools for charting your child's progress, which, according to the Study Dog website, is pretty stellar; 6 million kids have learned to read better. The price of Study Dog isn't too bad, either. If you pay for the year, it's just $4.99 month. It's more if you pay by the month, but you can do a free 7 day trial, and then you have 30 days to cancel for a full refund. It's would certainly be worth the money for me if I still had a young child in the house. Check out Study Dog and let me know what you think in the comments below.